1. Prepare turkey sausage: in a medium bowl, combine sausage ingredients and mix well. Cover and refrigerate for 8-12 hours. 2. Preheat oven to 375 degrees Fahrenheit. With a spoon, scrape out squash seeds and membranes. Rinse seeds and transfer to a sheet of paper towel and let dry completely; discard membranes. On a large baking sheet, place squash cut side up and drizzle with 2 tbsp oil. Season with 1/4 tsp sea solt and 1 tsp black pepper. Transfer to oven and roast until edges are golden and a knife inserts easily into flesh, 30-35 minutes. Remove from oven and set aside. 3. Meanwhile, on a small baking sheet, place seeds in a single layer. Transfer to oven and roast, stirring every 5 minutes, until crisp and golden brown, 15-20 minutes. Remove from oven and sprinkle with remaining 1/4 tsp sea salt. 4. In a large skillet, heat remaining 1 tbsp oil on medium-high. Add turkey mixture and cook, breaking it up into chunks with a wooden spoon, until well browned and cooked through, 8-10 minutes. Transfer to a plate and cover to keep warm. Wipe out skillet. 5. In same skillet, melt butter on medium heat. Add cabbage and cook, stirring, until tender and almost translucent, about 4 minutes. Add bell peppers and onion and cook until onion softens and peppers are tender-crisp, 6-8 minutes. Add turkey mixture and garlic and cook for 2 to 4 minutes. Stire well to combine and blend flavors. If desired, season with additional sea salt and black pepper. 6. Arrange 1 oven rack in top position and preheat broiler on low. 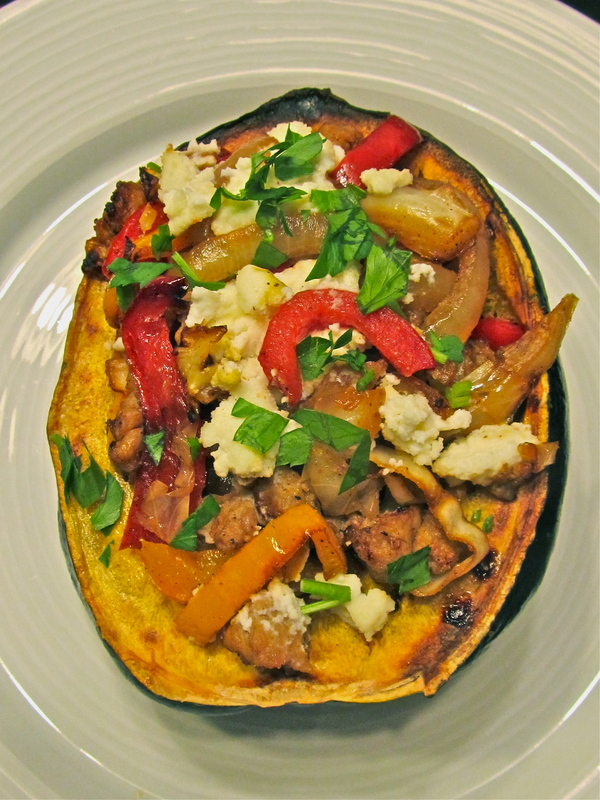 Spoon turkey-pepper mixture into squash halves and top with ricotta and seeds, dividing evenly. Transfer to top rack of oven and broil until ricotta just melts, 1 to 2 minutes. Garnish with parsley, dividing evenly. Caolories 335; total fat 13g. ; sat. fat. 4g; monounsaturated fat 5g; polyunsaturated fat 1g; carbs 35g; fiber 6g; sugars 10.5g; protein 24g; sodium 426mg; cholesterol 46mg. Calories 158 (22% from fat) fat 3.8g; protein 10.5g; carb 23.5g; fiber 4.6g; chol 7mg; iron 2.2mg; sodium 760mg; calc 84mg. The first thing I want to share about this recipe is that you should be prepared to use half the cooking dishes and utensils in your kitchen in its preparation. But I find that’s true for many casseroles. The second thing I want to share is that I actually thought it tasted better as a left-over than on the night I originally baked it. The recipe makes 6 nice, hearty servings. I microwaved the leftovers, which worked very well as long as the serving was covered in plastic to keep moisture in. 2. Combine rice, 1/4 cup Parmesan cheese, 1/4 teaspoon salt, fines herbes, and egg whites. Press mixture into an 11 x 7 inch baking dish coated with cooking spray. Sprinkle fontina evenly over rice mixture. 3. Cook broccoli in boiling water for 4 minutes or until tender, drain well. 4. Heat a large nonstick skillet over medium heat. Coat pan with cooking spray. Add onion to pan; cook 4 minutes or until tender, stirring occasionally. Stir in broccoli. Spoon broccoli mixture evenly over rice mixture. Top with cheddar cheese. 5. Combine egg substitute, milk, remaining 1/2 teaspoon salt, and black pepper in a small bowl, and stir well with a whisk. Pour the egg mixture over the broccoli mixture. 6. Place bread in a food processor; pulse 10 times or until coarse crumbs measure 1 1/4 cups. Combine breadcrumbs and remaining 2 tablespoons Parmesan cheese. 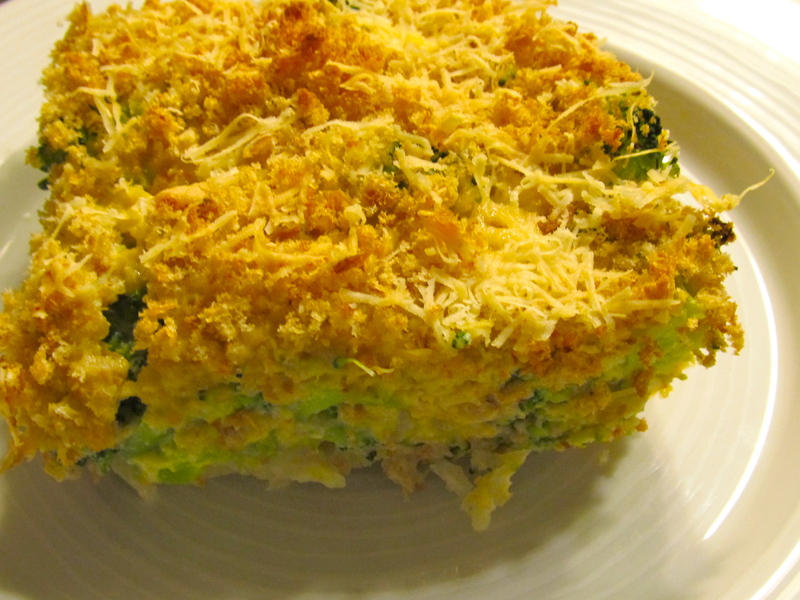 Sprinkle breadcrumb mixture evenly over broccoli. Bake at 400 degrees for 23 minutes or until set. This soup is delicious, though there are some minor differences between mine (pictured above) and the original recipe. I used sweet chicken Italian sausage, made fresh my the New Pioneer Coop in Iowa City (rather than turkey as called for in the recipe.) When it was finished, I thought it was missing something – then realized the recipe didn’t call for salt or pepper. Salt was unnecessary. But fresh ground pepper made the flavor of the soup really pop. I LOVE fennel, so I used slightly more than the recipe called for. Oh, and by the way, I had to ask the produce guy at the store white green was the escarole. I have never cooked with it, but I think it’s delicious in the soup! 1. Heat a large saucepan over medium-high heat. Add olive oil to pan; swirl to coat. Add onion, fennel bulb, garlic, and sausage; cook 7 minutes or until sausage is browned, stirring frequently to crumble. Add broth, 1 cup water, and beans. Cover; bring to a boil, and cook 5 minutes, stirring occasionally. Stir in escarole; cook 4 minutes or until escarole wilts. Divide soup evenly among 4 bowls; sprinkle with Parmesan cheese. Yield: 4 servings (serving size about 1 1/4 cups soup and 1 1/2 teaspoons cheese). In my oven, this took quite a bit longer than the recommended cook time. The strata does puff, so you should put a cookie sheet underneath to prevent it from dripping onto your oven – as mine did. Also, I recommend a sparing hand with the maple syrup – the strata itself has subtle flavors which can be overwhelmed by too much of a good maple syrup. 2. Arrange half of bread in an 11×7 inch glass or ceramic baking dish coated with cooking spray. Spoon pear mixture evenly over bread; top evenly with cheese. Arrange remaining bread over cheese. 3. Combine the remaining 5 tablespoons granulated sugar, milk, egg substitute, and cinnamon, stirring with a whisk. Pour milk mixture over bread, pressing down to submerge. Cover and chill 8 hours or overnight. 5. Uncover dish. Sprinkle turbinado sugar evenly over bread. Bake at 350 for 55 minutes or until a knife inserted in center comes out clean. Let stand 10 minutes. Cut into 8 equal pieces; drizzle with syrup. These souffles were not hard to make, though they used a lot of dishes! The texture is very soft and light, so they pair well, in my opinion, with something a little more substantial: crusty bread, a thick-cut bacon. I had mine with a fresh salmon patty I purchased at the New Pioneer Co-op in Iowa City this afternoon. It made for a delicious, light dinner. 1. Place a baking sheet in the oven. Preheat oven to 425 degrees. 2. Coat 4 (6 ounce) ramekins with cooking spray; sprinkle evenly with breadcrumbs, tilting and turning dishes to coat sides completely. 3. Heat a large nonstick skillet over medium-high heat. Lightly coat pan with cooking spray. Add spinach; cook for 2 minutes or until spinach wilts, tossing constantly. Place spinach in a colander, let stand 5 minutes. Squeeze excess liquid from spinach. Coarsely chop spinach. 4. Combine 2/3 cup milk and the next 4 ingredients (through black pepper) in a small saucepan over medium-high heat, stirring with a whisk until smooth. Cook for 2 minutes or until mixture is thick and bubbly, stirring constantly. Spoon mixture into a large bowl, and let stand for 10 minutes. Stir in spinach, cheese, and egg yolks. 5. Combine egg whites and cream of tartar in a large bowl, and let stand at room temperature for 15 minutes. Beat with a mixer at high speed until medium peaks form (do not overbeat). 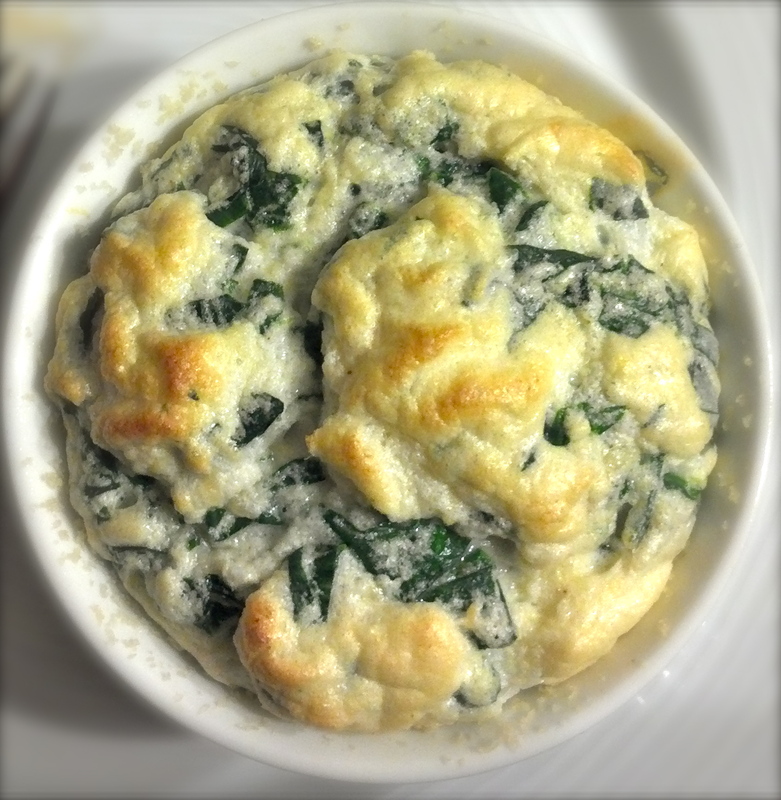 Gently stir one-fourth of egg whites into spinach mixture, and gently fold in the remaining egg whites. Gently spoon mixture into prepared dishes. Sharply tap dishes 2 or 3 times on counter to level. Place dishes on preheated baking sheet; return baking sheet to 425 degree oven. Immediately reduce oven temperature to 350 degrees for 21 minutes or until puffy and golden brown. Serve immediately. Yield: 4 servings. Nutrition: Calories 163; fat 6g (sat 2.8 g); protein 13.2 g; carb 14.6g; fiber 1.4g; chol 115mg; iron 1.7mg; sodium 405mg; calc 218mg. Per serving: 258 calories; 14 g fat ( 4 g sat , 9 g mono ); 88 mg cholesterol; 24 g carbohydrates; 0 g added sugars; 8 g protein; 2 g fiber; 379 mg sodium; 217 mg potassium. Coat a large (at least 12 inch) oven-proof skillet with cooking spray and heat on medium. Add turkey, season with salt and pepper and cook, breaking up meat with a spoon, until no pink is visible, 5 to 6 minutes. Transfer turkey to a bowl, returning skillet to heat. Add potatoes and thyme to hot skillet and season with salt and pepper. Transfer skillet to oven and cook until lightly browned and tender, about 20 minutes, stirring once. Carefully return skillet to stovetop on medium-high heat (leave oven on at the same temperature). Add broth and bring to a simmer. Add chard and stir just until wilted. Stir in tomatoes, rosemary, chili flakes, lemon juice and reserved turkey. Ensure broth is simmering and transfer skillet back to oven. Cook until tomato skins burst, about 10 minutes, stirring halfway through. Divide mixture among 4 bowls and top evenly with feta. Serve immediately with lemon wedges. In a larger non-stick skillet on medium to medium-high, saute mushrooms, red peppers, artichoke hearts and onions in olive oil and herbs de Provence until softened and warmed through. Place mixture in a round cake pan, or divide among 4 large ramekins, either misted lightly with cooking spray. Cover with eggs and add goat cheese in small drops before sprinkling with Parmesan. Cook in oven for 25 minutes or until set. Enjoy or let cool to room temperature, cover and store in fridge. Serve warmed or cold. Calories: 168, fat 8 g., carbs 7 g., fiber 3 g., protein 17 g.
2. Arrange nuts in a single layer on a jelly-roll pan. Bake at 400 for 5 minutes or until toasted, stirring twice. Place nuts in a bowl. Drizzle butter over warm nuts; sprinkle with sugar and 1/8 teaspoon pepper. Toss well to coat. 3. Combine squash and 1 tablespoon oil, tossing to coat. Arrange squash in a single layer on jelly-roll pan. Bake at 400 for 15 minutes or until squash is just tender. Remove from pan; stir in garlic. Set aside. 4. Bring broth and 1/2 cup water to a simmer in a saucepan (do not boil). Keep wry over low heat. 5. Heat a large saucepan over medium heat. Add pancetta to saucepan; cook 5 minutes or until browned, stirring frequently. Add onion; cook 3 minutes or until tender, stirring occasionally. Add rise; cook 2 minutes, stirring constantly. Add wine; cook 1 minute or until liquid is nearly absorbed, stirring constantly. Add broth mixture, 1/2 cup at a time, stirring constantly until each portion of broth is absorbed before adding the next (about 20 minutes total). Stir in squash, thyme, 1/4 teaspoon salt, and 1/4 teaspoon pepper. Top with cheese and nuts. Yield: 8 servings (serving size: about 2/3 cup risotto, 1 1/2 teaspoons cheese, and 1 tablespoon nuts). Preheat oven to 450 degrees. On a rimmed baking sheet, toss 2 pounds fingerling potatoes or other small potatoes and 4 sprigs oregano with 1 tablespoon extra-virgin olive oil (I just sprayed them with olive oil spray to coat); season with coarse salt and ground pepper. Arrange in a single layer and roast until potatoes are tender when pierced with a knife, about 30 minutes, tossing halfway through. Transfer to a searing bowl and toss with 1 tablespoon fresh lemon juice. Serves 6. 1. Heat olive oil in a Dutch oven over medium heat. Add onions, cook 5 minutes or until tender, stirring frequently. Add apple and the next 4 ingredients (through garlic); cook 1 minute, stirring constantly. Add parsnip, chicken broth, and apple cider, bring to a boil. Cover, reduce heat, and simmer for 30 minutes or until parsnip is tender. 2. Place half of parsnip mixture in a blender. Remove center piece of blender lid (to allow steam to escape); secure blender lid on blender. Place a clean towel over opening in blender lid (to avoid splatter). Blend until smooth. Pour into a large bowl. Repeat the procedure with remaining parsnip mixture. Stir in salt and pepper. Ladle about 3/4 cup soup into each of 8 bowls, top each serving with 1 teaspoon creme fraiche. Yield: 8 servings. 1. Heat 1 tablespoon oil in a large nonstick skillet over medium heat. Add parsnip to pan; cook 12 minutes or until tender and browned, stirring occasionally. Place in a large bowl; keep warm. 2. Heat remaining 1 tablespoon oil in pan over medium-low heat. Add onion to pan; cook 20 minutes or until tender and golden brown, stirring occasionally. Stir in thyme and garlic, cook 2 minutes. Add wine; cook 3 minutes or until liquid almost evaporates. Stir in kale and broth; cook, covered, 5 minutes or until kale is tender. Uncover, cook 4 minutes or until kale is very tender, stirring occasionally. 3. Cook pasta according to package directions, omitting salt and fat. Drain pasta in a sieve over a bowl, reserving 3/4 cup cooking liquid. Add drained pasta to kale mixture. Stir in parsnips, 1/2 cup reserved cooking liquid, 1/4 cup cheese, 1/2 teaspoon salt, and 1/2 teaspoon pepper. Cook for 1 minute or until thoroughly heated. Add remaining 1/4 cup cheese. Yield: 6 servings (serving size: 1 2/3 cups). Heat one teaspoon olive oil in a small nonstick skillet over medium heat. Layer in 1/2 cup each frozen shredded hash browns and frozen chopped spinach (from a bag). Crack 1 large egg on top; sprinkle with a pinch each of salt and pepper and 2 tablespoons shredded sharp Cheddar cheese. Cover, reduce heat to medium-low and cook until the hash browns are browned, the egg white is set and the cheese is melted, 4 to 7 minutes. Makes 1 serving, 226 calories. 1. Preheat oven to 450 degrees. Place 2 bone-in, skin-on chicken breasts (6 to 8 ounces each) on a rimmed baking sheet. Drizzle with 2 teaspoons olive oil and season with coarse salt, ground pepper, and 1 teaspoon fresh thyme leaves. Roast until cooked through, 35 minutes. When cool enough to handle, shred chicken into pieces. In a small bowl, stir together 1 tablespoon fresh lemon juice, 1 small shallot, minced, 1 garlic clove, minced, 2 tablespoons oil, and 1 teaspoon thyme; season dressing with salt and pepper. 2. Meanwhile, in a medium pot, bring 3/4 pound Yukon Gold potatoes, sliced 1/4 inch thick, to a boil in salted water and cook until potatoes are tender when pierced with a knife, 5 to 7 minutes; drain well. 3. In a large nonstick skillet, heat 1 1/2 teaspoons oil over medium-high. Add half the potatoes in one layer. Cook, undisturbed, until potatoes are golden brown and crisp, then flip and cook other side, 5 minutes total. Drain on paper towels. Repeat with more oil and remaining potatoes. 4. In a large bowl, toss together chicken, potatoes, and dressing with 1/2 pound spinach, trimmed, washed, and torn into bite-size pieces. Serves 4. Combine first 4 ingredients in a large Dutch oven over medium-high heat. Cook 5 minutes or until beef is browned, stirring to crumble. Stir in chili powder, cumin, sugar, and salt; cook 1 minute. Add oregano and next 4 ingredients (through beer) to pan; bring to a boil. Reduce heat and simmer 15 minutes. Stir in cornmeal; cook 5 minutes. Stir in juice. I made several changes to this recipe, most notably the addition of chicken to a vegetarian soup. Now that I’ve made it, I think it would be wonderful in its original form, though I wanted something heartier. A few other notes: I followed the amounts in the recipe except that my celery root wasn’t big enough and yielded 2 cups, which I thought was plenty. Also, the pepper gave the soup quite a bite — adjust downward if you don’t care for pepper! Finally, I was too hungry by the time my soup was finished to bother pureeing some of it — though I will definitely do that if I am making the vegetarian version. For the chicken, I simply baked 2 boneless, skinless breasts in a 350 degree oven (sprayed with olive oil spray, seasoned with salt, pepper, small amount of garlic powder) while my wild rice cooked. The rice and the chicken were ready at approximately the same time! 1. Melt butter in a large saucepan over medium heat. Add leek and carrot; cover and cook 5 minutes or until tender. Stir in wine, scraping pan to loosen browned bits. Add celeriac, broth, 1 cup water, salt and pepper, bring to a boil. 2. Place 1 cup soup mixture in a blender. Remove center piece of blender lid to allow steam to escape; secure blender lid on blender. Place a clean towel over opening in blender lid to avoid splatter. Blend until smooth. Add pureed soup mixture back to saucepan. Add wild rice (and chicken or turkey), cook 15 minutes. Sprinkle with chives. Couldn’t resist this recipe when I saw it in “Freshly Pressed” yesterday, on a crisp fall Saturday. I roasted my own pie pumpkin last night and used that in the recipe. Truly delicious – my Dad ate two large helpings! Preheat oven to 375 degrees. Grease 5 cup baking dish or the equivalent of smaller dishes. In a mixing bowl, combine oats, pumpkin, milk, egg, pumpkin pie spice, vanilla and salt. Stir together then spoon into baking dishes. Bake for 15 minutes, remove, sprinkle with 1 tablespoon unpacked brown sugar per baking dish (though I used one dish and 3 tablespoons sugar, since the recipe I copied divided dish into 3 containers). Then turn the oven up to 4oo degrees and bake for 10-15 minutes or until set in center. I did not have chives, so I minced some onion, and added fresh flat leaf parsley to the recipe. The trickiest part of this recipe was pouring the eggs into the tomato halves without spilling — I spilled twice before getting them in the oven! 1. Preheat oven to 350 degrees. Line a 9-inch baking dish or pie plate with parchment. With a serrated knife, cut off the top 1/2 inch from each tomato. With a spoon or a melon baller, gently remove seeds and inner membrane, being careful not to break through flesh of tomatoes. Place tomatoes in dish and season with salt and pepper. 2. Divide corn among tomatoes. In a medium bowl, whisk together eggs and chives and season with salt and pepper. Divide egg mixture among tomatoes and top with cheese. Bake until egg mixture is set, 45-50 minutes. Serve warm. Preheat oven to 425 degrees. On a large rimmed baking sheet, toss 1 acorn squash, halved, seeded, and cut into 1-inch wedges, with 2 Tbs extra-virgin olive oil (I sprayed it with spray olive oil, and used less than two tablespoons) and season with coarse salt, ground pepper, 1/4 teaspoon each ground cumin, ground coriander, and 1/8 teaspoon cayenne pepper (I accidentally used 1/4 teaspoon, and it was a little spicier but delicious). Arrange squash, cut side down, in a single layer and cook until tender, 30 minutes, flipping halfway through. NOTE: I used a lower 350 degree temp in order to cook with “Baked Eggs In Tomatoes”. The squash was done at the same time the tomatoes were — approx. 50 minutes at 350 degrees. This recipe was created on the fly with, mostly, ingredients from my weekly CSA share. I used an on-line recipe analyzer to determine the nutritional information. I think the soup is tasty, but it is a little spicy. I chopped what I thought was a small red bell pepper and placed it in the soup – only to discover that it was a hot pepper! The soup was good the first night, but even better after it has time for flavors to meld. Delicious. Brown the sausage in a non-stick skillet. Chop and add the onion, and the garlic. While the onion cooks, chop the celery and carrots. Add to the skillet. Chop remaining veggies, set aside. Once the sausage is cooked through and the onion is translucent, drain the meat mixture, then place in a soup pot. Add the chicken broth and water, then the remainder of the chopped veggies. Bring to a boil, then reduce heat and simmer until veggies are cooked. Makes 6 servings. 274 calories. 12 g fat (3.8 g saturated); 32 mg cholesterol; 847 mg sodium; 27.9 g carbs. (5.7 g fiber, 5 g sugars); 14.1 g protein. These tomatoes are delicious. I ate mine on hearty cracker bread, with the roasted garlic and a little cracked-pepper goat cheese spread under them. 2. Slice the very top off the whole garlic bulbs to expose the tops of the cloves and place in the center of a roasting tray. 3. Wash the tomatoes and cut into halves. 5. Put the oil, garlic, and dried herbs into a large bowl. 6. Add the tomato halves and stir until well coated with the oil and flavorings. Then place into the roasting tin and sprinkle with black pepper, celery salt and sugar. Place in the oven for 40-50 minutes, or until the tomatoes are golden on top and nicely caramelized. 7. Sprinkle the fresh basil over the top. To serve, squeeze the soft, roasted garlic out of its skin and serve with the tomatoes. The instructions for this recipe, found in True Food: Eight Simple Steps to A Healthier You, tell you to substitute the raisins with any other (local) dried fruit or nuts that you like. I made mine with dried cherries and walnuts, because they were “locally” available in my kitchen, along with the tender kale which came in my first produce from Abbey Hills Farm (the CSA I bought 1/2 a share in this summer). I LOVED this dish, which is why I am breaking my rule of sharing a recipe for which I have no nutrition information — but I know its good for you! Rinse kale and dry thoroughly. Remove and discard thick ribs and tear leaves into pieces, then dry again. Spread kale on a large rimmed baking sheet and toss with oil and fruit. Bake for 10 minutes, stirring every 5 minutes. When leaves begin to crisp on edges, toss in nuts. Cook another 5 minutes until kale is slightly browned and crisp, watching that nuts don’t brown too much. This dish is amazingly delicious. If you haven’t cooked with fennel before, I think you’ll like it! Preheat oven to 450 degrees. Boil 3 fennel bulbs, trimmed and split lengthwise, until tender, about 15 minutes. Drain fennel, cut side down, on paper towels, 5 minutes. Place fennel, cut side up, in a buttered (I used cooking spray) 8-inch square baking dish and brush with 1 tablespoon softened butter. Season with coarse salt and ground pepper and top with 1/3 cup grated parmesan and 4 sprigs thyme. Bake until cheese is golden brown, about 20 minutes. Serves 6. I made the recipe without freezing the chicken and marinade. The recipe notes that, if you choose this option, marinate the chicken for 30 minutes before cooking. Stack cutlets in a double layer in a 1-gallon freezer bag. In a small bowl, combine 2 tablespoons butter, wine, garlic and thyme and whisk to combine. Season with pepper. Pour marinade into bag with cutlets and freeze. (Press air out of freezer bag, seal, and freeze flat. Store in the freezer up to 2 months). To serve, thaw chicken in refrigerator overnight. Remove cutlets from bag and discard marinade. Gently shake chicken to remove liquid and season with salt. In two batches, heat 1 1/2 teaspoons butter and 1 1/2 teaspoons oil in a large skillet over medium-high heat; add half the cutlets to pan and cook until browned and cooked through, 4 minutes total, flipping halfway through and adjusting heat as necessary to prevent pan from overbrowning. Serve chicken sprinkle with parsley if desired. Serves 4. I have avoided sauces for meat made from yogurt, though many light recipes include it. But I was willing to set aside my prejudice and give it a shot for once — and the result was truly delicious! I thought this was a wonderful combination of flavors and textures. Since it is winter, I used my grill pan on the stove rather than the backyard grill. 1. Sprinkle both sides of pork with 1/4 teaspoon each salt and pepper. Cut pineapple crosswise into 1/2-inch-thick slices; set aside. In a bowl, combine yogurt and 2 tablespoons marmalade; set aside. 2. Grill pork on the rack of an uncovered grill directly over medium coals for 4 minutes. Turn; add pineapple to grill. Brush pork and pineapple with remaining marmalade. Grill 3 to 5 minutes more or until an instant read thermometer inserted in pork registers 160 degrees F and pineapple has light grill marks, turning pineapple once. 3. Arrange pineapple and pork on serving plates. Spoon yogurt mixture over pork and pineapple; sprinkle with fresh thyme. Makes 4 servings. Per serving: 295 calories; 5 g total fat (2g sta. ); 94 mg cholesterol; 242mg sodium; 28g carbs; 2g fiber; 35g protein. This dish is very satisfying, as I discovered during a recent bitterly cold week. It is warming and filling. I could not imagine pot pie without peas, so I added frozen peas (about 1/2 cup). The nutrition info at the end of this recipe is for the recipe sans peas! 2. In a bowl, combine rice, 1 teaspoon oil and cheese and mix well. Season with salt and pepper and set aside. 3.In a large nonstick skillet, heat 1 teaspoon oil over medium-high heat. Add turkey and cook, turning often, until golden brown and just cooked through, about 6 minutes. Remove turkey from pan and set aside. Return skillet to stove, lower heat to medium and add remaining 1 tablespoon oil. Add carrots, turnip, leek and onion and cook, stirring constantly. Add broth and stir until mixture begins to simmer and thicken, about 4 minutes. Stir in yogurt and mix well. Add reserved turkey, parsley and sage and stir to combine. Season with salt and pepper. 4. Pour turkey mixture into an oven-safe baking dish. Top with rice mixture in an even layer and bake until filling is bubbling and rice is light golden brown, about 30 minutes. Let rest 5 minutes before serving. 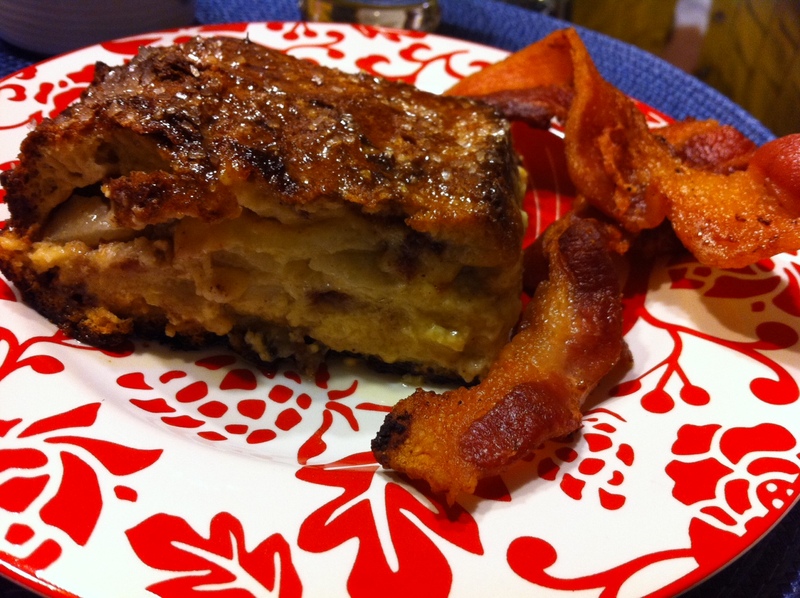 Per 1 1/2 cup serving: calories 230; total fat 6g (sat. 1g); carbs 25g; fiber 3g; sugars 4g; protein 19g; sodium 130mg; cholesterol 40mg. Surprisingly addictive, this snack mix is only 79 calories per serving, but beware that the serving size is only 1/4 cup. I have taken to putting snack foods into snack size baggies as soon as they enter my house, I find I have a lot better self-control that way. I know it’s not environmentally friendly, so I’m hoping that it is a stop-gap measure until I retrain myself to eat the right portion size and feel satisfied with that. 1. Preheat oven to 300 degrees. In a 15x10x1 inch baking pan, combine cereal and almonds. In a small bowl, stir together melted butter, apple pie spice, and a dash of salt. Drizzle butter mixture over cereal mixture; toss to evenly coat cereal and almonds. 2. Bake 30-35 minutes or until almonds are toasted, stirring once. “Cool snack mix in pan on a wire rack for 20 minutes. 3. Stir in dried cherries. Cool completely. Store tightly covered at room temperature for up to 1 week. Makes (20 1/4 cup) servings. Per serving: 79 calories; 3 g fat (1 g sat. ); 3 mg cholesterol; 60 mg sodium; 12 carbs; 1 g fiber; 1 g protein. This recipe is simple, but do not underestimate how amazing the fresh herb butter is! Truly a feast for the senses and worth the couple of minutes to stir it up. Also, so fragrant and delicious, you don’t mind going light on the amount! I find that my microwave always needs more cooking time than recipes state, however, I’ve copies the recipe as written. 1. Scrub potatoes and place in a medium bowl (do not pierce potatoes with a fork). Cover bowl with plastic wrap. Do not allow plastic wrap to touch food. Vent. 2. While potatoes cook, combine butter and remaining 4 ingredients in a small bowl. 3. Cut each potato lengthwise; fluff with a fork. Top each potato evenly with butter mixture. Yield: 4 servings (serving size: 1 sweet potato and 2 1/4 teaspoons butter. Calories: 145; Fat 6 g (sat. 3.6g, mono,1.5g, poly 0.3g); Protein, 2.2g; Carb 21.8 g; fiber 3.6g; cholesterol 15mg; iron 0.8mg; sodium 150mg; calcium 44mg. This soup contains some really aromatic ingredients and I found myself really breathing in the scents while preparing it. The flavor is delicate, so I will likely play with adding some flavor components — maybe a tablespoon or two of tomato paste. Like many soups, it tastes best when the flavors have time to marry, so day two and three were more delicious than day one. In a large heavy-bottomed pot or Dutch oven, heat oil over medium heat. Add carrots, fennel, onion, garlic, bay leaves, thyme and fennel seeds, and cook, stirring often, until vegetables are tender, about 8 minutes. Add 6 cups water, beans, tomatoes and quinoa. Increase heat to high and bring to a boil. Reduce heat to low and simmer gently until quinoa is tender, about 20 minutes. Remove bay leaves and season with salt and pepper. Stir spinach and basil into soup just before serving in warm bowls. Garnish each with 1 Tbs cheese, if desired. Nutrients per 8-oz serving (including cheese): Calories: 137; Total Fat: 5g, Sat. Fat: 1g; Carbs: 19g; Fiber: 2g; Sugars: 3g; Protein: 5g; Sodium: 70mg; Cholesterol: 0mg. I thought this was really a tasty meal — and was impressed with the nutritional wallop it packs! In order to make 2 instead of 4 servings halve all ingredients (use 3/4 c beans and 3 Tbs each breadcrumbs and Parmesan). 1. Cut a small slice off the bottom of each squash half so it rests flat. Brush the insides with 1 tsp oil; sprinkle with 1/4 tsp each salt and pepper. Place in a microwave safe dish. Cover with plastic wrap and microwave on High until the squash is fork-tender, about 12 minutes. 2. Meanwhile, heat 1 Tbs oil in a large skillet over medium heat. Add onion; cook, stirring, until starting to brown, 2 to 3 minutes. Add garlic; cook, stirring for 1 minute. Stir in water, tomato paste and the remaining 1/4 tsp each salt and pepper. Stir in chard, cover and cook until tender, 3-5 minutes. Stir in white beans and olives; cook until heated through, 1-2 minutes more. Remove from heat. 3. Position rack in center of oven; preheat broiler. 4. Combine breadcrumbs, Parmesan and the remaining 1 Tbs oil in a bowl. Fill each squash half with about 1 c of the chard mixture. Place in a baking pan or on a baking sheet. Sprinkle with the breadcrumb mixture. Broil in the center of the oven until the breadcrumbs are browned, 1 to 2 minutes. Make 4 servings. Per serving: 342 calories; 13g fat (3g sat. 8g mono); 6mg cholesterol; 49g carbs; 11g protein; 12g fiber; 665mg sodium; 1,151mg potassium. Nutrition bonus: Vitamin A (100% daily value); Vitamin C (60%DV), Magnesium & Potassium (33%DV); Folate (29% DV); Iron (20% DV). 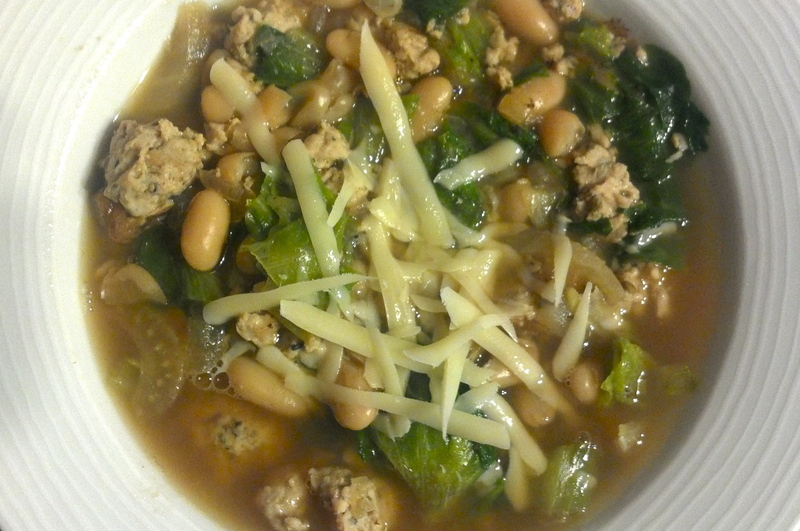 As with many soups, this one is best on day two, after its had more time for the flavors to meld. 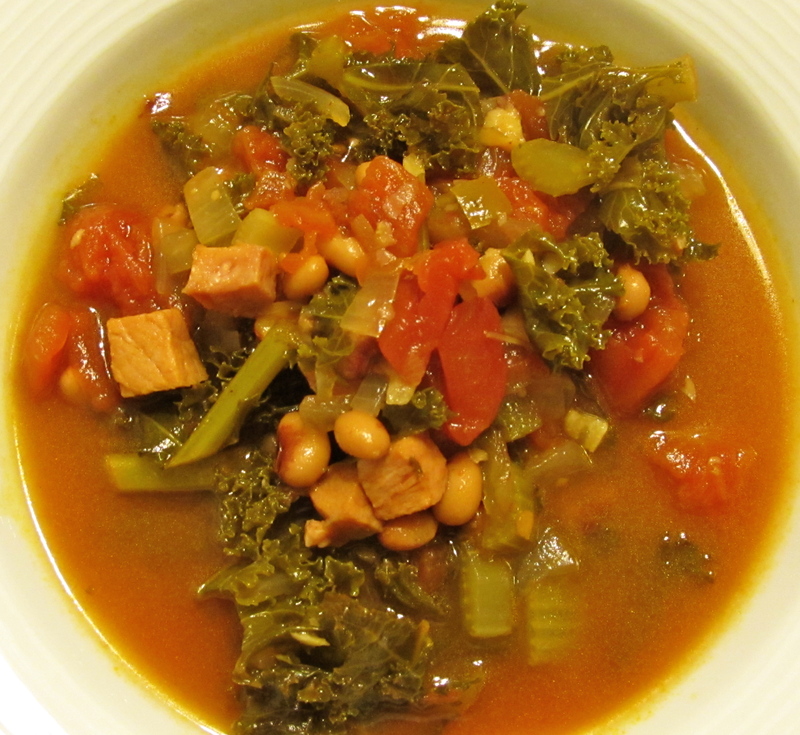 The soup gets most of its flavor from the sausage, so be sure to use one that is flavorful! Bring broth and tomatoes to a boil in a medium saucepan over high heat. Add beans and sausage; bring to a boil. Cook, uncovered, 8 minutes or until thoroughly heated. Stir in spinach; cook 1 minute or until spinach wilts. I love this recipe! Hearty, filling, delicious. If I were giving recipes ratings, this would be a four-star entry. Bring potatoes and whole garlic clove to boil in a pot of water set over high heat. Cook until potatoes are tender, about 15-20 minutes, then drain well. Mash potatoes and garlic until smooth. Add buttermilk and chives and season with salt and pepper. Set aside. Meanwhile, heat 1 tsp oil in a large nonstick skillet over medium-high heat. Add turkey and cook, stirring often and breaking meat into small pieces with a wooden spoon. Cook until no pink remains, about 8 minutes. Drain and discard fat; set turkey aside. Heat 2 tsp oil in skillet over same heat. Add onion, carrots, celery and rosemary and cook, stirring occasionally, until vegetables are soft, about 8 minutes. Add reserved turkey, broth, and tomato paste and continue to cook until most of liquid is absorbed, about 5 minutes. Stir in peas, transfer mixture to a shallow baking dish and cover with mashed potatoes in an even layer. Run a fork over top of potatoes in a crosshatch pattern or swirl with a spatula or the back of a spoon. Brush top with remaining 1 tsp oil and bake in oven until filling is bubbling and top is golden brown, about 30 minutes. Let stand 5 minutes before serving. Nutrients per 1 1/2 cup serving: Calories:160, Total fat: 4 g, Sat.Fat:0.5g, Carbs:10g, Fiber: 2g, Sugars:4g, Protein:20g, Sodium: 150mg, Cholesterol: 40mg. Note: I didn’t peel the potatoes (a more rustic look than the original), and I didn’t have rosemary so I used a pizza/pasta salt-free prepared herb mix that I already had on hand. Truly delicious, comforting fare. The serving size is generous, so it really is filling! Way to go Jenifer, keep up the good work! I didn’t know you were doing anything like this until last week when I seen your newspaper interview on the dining room wall (I need to get out of the basement more often)! Please feel free to share with anyone you choose! And thanks!